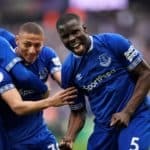 Everton will feel aggrieved to only emerge from a tough encounter with Aston Villa with a 2-2 draw, after a Jermaine Beckford strike was ruled out incorrectly. Everton took the lead thanks to Leon Osman, after excellent recovery play from Diniyar Bilyaletdinov. This was cancelled out by Darren Bent after a surging run inside from the right from Downing allowed the England striker to smash beyond Howard. The major talking point was the disallowing of Beckfords strike in the second half. The ex-Leeds man was played onside by Villa full-back Luke Young, and he thundered a shot beyond Friedel, which struck the underneath of the crossbar and appeared to cross the line. However, the linesman disagreed, and Villa promptly countered, with Darren Bent – who appeared to be offside – breaking free and prodding underneath the onrushing Tim Howard to give Villa the unlikeliest of leads. 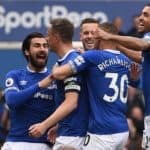 Justice prevailed, when Everton were awarded their first penalty of the season, after Phil Jagielka surged into the box on the right edge of the area and went over the leg of Jean Makoun. It appeared as though Jagielka had dived over the leg rather than any meaningful contact being made, but the end result was a Leighton Baines penalty struck firmly down the middle and beyond Friedel to give Everton a deserved equaliser. Everton gave debuts to impressive youngsters Apostolos Vellios and Magaye Gueye off the bench, the latter appearing to be right at home in the first team mix, but once again Everton fans will leave Goodison feeling that it´s a case of two points dropped. Everton 2 Aston Villa 2.